Buff with the NEW FLITZ Polishing Ball. 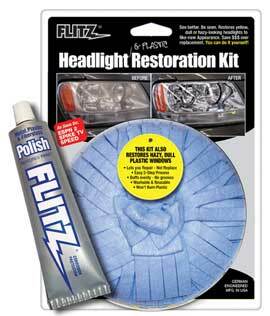 When it comes to Headlight Restoration Kits, the choice is Clear. Best of all- YOU CAN DO IT YOURSELF! One kit does it all: Headlights, tail lights, windshields, plastic camper windows, eisenglass, helmet face shields, boat hatches, light bars, bug deflectors... Fast, safe & easy-to-use. Bottom line? This kit really works. Guaranteed! Plus, unlike other kits, this one is washable and reusable, so you can use it again & again. Improve visibility, stay safe. Simple 1-step process. No hazardous chemicals.